Here the will of God is done, as God wills, and as long as God wills. When we first started writing about the saints, I would have been surprised if someone had told me that we were going to have posts about St. Jude, St. Dymphna, and St. Gerard. In my mind they are the in the purview of a group of people whose spirituality verges on superstition, and who don't really know much about the saints, but only what they are supposed to do for us. Behind all of the flowery prayers and devotions, however, there are real men and women, who were regarded by those who knew them as being holy people with an extraordinary love for the Lord. Some experts in pastoral theology or historical anthropology describe popular piety as an inferior or degraded state of faith when in reality it's a matter of expressing the relations with the Transcendent in a different way. It might seem that popular piety is somewhat deficient and can find its legitimization only in the liturgy of the Church and in the official cult. But that argument forgets that liturgy, too, is the result of the influence of theological currents on a given epoch and environment. In other words, liturgy, too, is a cultural product. St. Gerard, as most of you probably know, is the patron saint of expectant mothers and in the past several years, our family has had abundant reason to seek St. Gerard's intercession since we've had thirteen pregnancies in the past 10 years. However, I don't think I really started praying to St. Gerard until February of this year when there had been two recent miscarriages in my family, and my granddaughter was having a very difficult pregnancy. I decided at that time that he would be one of the saints I would write about and have since read some background material, much of which I have, unfortunately, forgotten. St. Gerard was born on April 6, 1726. The lateness of the date surprised me because after reading about his life, I would have put it much earlier. I think it is because he lived in a small village in Italy, Muro Lucano in Naples, and life in rural villages does not change as rapidly as life in big cities. "On seeing how miserably Gerard was dressed, [his Capuchin uncle, Eustachio Gabella] bought him a greatcoat; but when Gerard, coming out of the friary, met a poor man wrapped in rags, he took compassion on him, and immediately took off the coat and gave it to him." Tonnoia records that "his uncle was not best pleased." He was a sickly youth, and because of that, and also because of the objections of his mother (She locked him in the house when the missionaries were coming, but he escaped through the window. ), he had a hard time being accepted into a religious order, but he finally convinced the Redemptorists to take him on trial. After three years, on May 17, 1749, he took his religious vows. Bartolomeo Melchione had been a bright spark about town when a bachelor, but after a year of marriage, "he had become dull and heavy." Gerard cooked him a meal and then spent the evening singing songs with him. Melchione kept up a chorus all the way home to his wife. His friends thought it a miracle. And it must be supposed that his wife forgave Gerard for keeping Melchione out so late. A nice smile turneth away anger. What affected him most as he contemplated the Passion was to see the way our Blessed Lord was reviled as a fool; he therefore resolved to simulate madness so that he could share in His humiliation. And Gerard's passion was the Passion. He longed to suffer the sufferings of Christ. He took part in many Passion Plays, and asked the other actors to beat him in the same way that Christ was beaten, and insisted that the crucifixion be as like the original as possible. Needless to say, his mother did not approve of this--once she fainted during a particularly realistic performance--and I'm pretty sure that his superiors did not let him go to these extremes, although I can't find the reference at the moment. St. Gerard also had a great devotion to the Blessed Mother. When he was young--I don't know how young, he was sitting in the front row of the church on the feast of the Immaculate Conception (This had not yet become a dogma of the Church, but I suppose it was a local feast. ), and he was seen to get up, remove a ring, and put it on Mary's finger. From then on he always told people that he was married to the Virgin Mary. Although St. Gerard did not have much formal education, he was extremely knowledgeable about the Faith. He loved to read theology and the teachings of the Church and did so whenever he had free time. Eventually people started coming to him for advice in these matters and even priests in high positions were impressed with his knowledge. 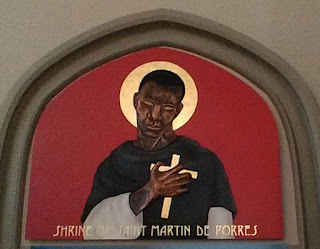 As with any saint, especially a saint like this whose sanctity was first acknowledged by the people, there are many stories of miraculous happenings. 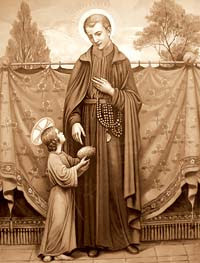 Once when he was a boy, St. Gerard was given a loaf of bread by a little boy. When he took it home, his mother wanted to know where he had gotten such a fine loaf--not the usual fare of the people in that town. When he was older, he told his sister that he had not realized it at the time, but now he thought that it had been the child Jesus. Thus, the above picture. In a story told by Tannoia, Gerard was once riding on a treacherous road, surrounded by fog, when a footpad accosted him saying, "Behold, my hour is come. You are in my power." Gerard, recognizing that this was the evil one said, "I command you in the name of the most adorable Trinity to take my horse's bridle and lead me safely to Lacedonia." And he did. He laid open the deepest wounds of their souls to some, and set before others the duties of their station, and their infidelities in the performance of them. Although there were are many stories about his prayers for women who wanted to conceive or knowledge about pregnancies, the event that led to him becoming the patron of expectant mothers can be found on the Redemptorist website. His miraculous apostolate for mothers also began during his lifetime. Once, as he was leaving the home of his friends, the Pirofalo family, one of the daughters called after him that he had forgotten his handkerchief. In a moment of prophetic insight Gerard said: "Keep it. It will be useful to you some day." The handkerchief was treasured as a precious souvenir of Gerard. Years later the girl to whom he had given it was in danger of death in childbirth. She remembered the words of Gerard, and called for the handkerchief. Almost immediately the danger passed and she delivered a healthy child. On another occasion the prayers of Gerard were asked by a mother when both she and her unborn child were in daTnger. Both she and the child came through the ordeal safely. One of the most difficult events of St. Gerard's life occurred when he was falsely accused of sexual misconduct by a woman whom he had counselled. He never defended himself because he believed that the rule of his order prevented him from doing so, and he was removed from ministry. In the end, the woman admitted that she had lied. During the year of 1755, the saint was increasingly being weakened by tuberculosis and he died in October of that year at the age of 29. Suffering alone because he was in quarantine, he believed that he was reliving the Passion of Christ, his most devout wish. He was canonized by Pope St. Pius X on December 11, 1904 and his feast day is on October 16. 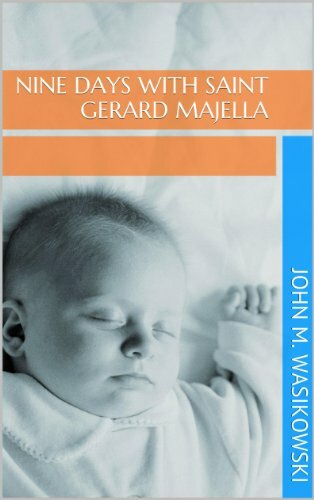 Nine Days with St. Gerard Majella is a little Kindle book which contains a nice novena to St. Gerard. I like it better than most novenas. It was written by a man whose wife is a nurse and daily asks St. Gerard to intercede for her patients. It only costs $.99.